No place to keep your inventory or promotional items? Our warehouse and fulfillment division is a value added service for our clients. We can warehouse the displays and promotional goods, fulfill with needed instructions or marketing materials, and drop ship to your end users worldwide. 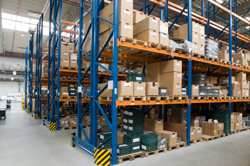 Our warehouse also provides storage and services for promotional items stored as inventory for corporate logo stores.